Drain and rinse the black-eyed peas (or black beans) and corn. Finely chop the cilantro and green onions. Dice the tomatoes and avocado. Combine all veggies in a large bowl. Mix oil, vinegar or lime juice, salt and pepper together in a small bowl. Pour oil mixture over salad ingredients and toss lightly. 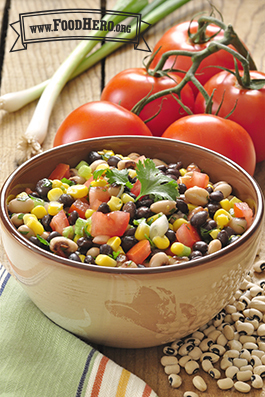 Serve with your favorite meal or as a snack with tortilla chips. Try adding other vegetables such as sweet or hot peppers or zucchini. & a glass of low-fat milk.